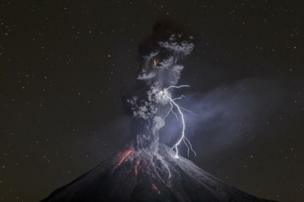 An image of a volcano struck by lightning has beaten photographs of crocodiles, dervishes and surfers to win this year's grand prize. The winning image was selected from a shortlist of three categories: People, Cities and Nature. 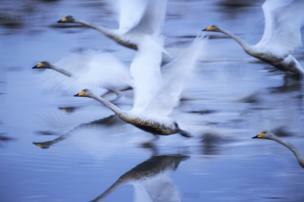 Hiromi Kano took second place in the Nature category with this image of swans mid-flight. 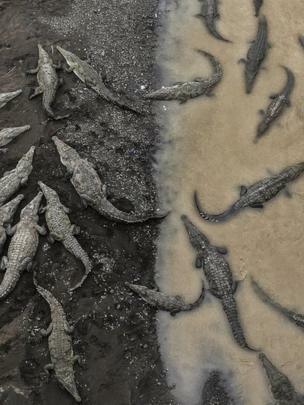 Third place winner Tarun Sinha came across 35 crocodiles while crossing a bridge in Costa Rica. "I wanted to capture the stark difference between the crocodiles on land and in the water," he said. "In the murky waters, the body contours of these beasts remain hidden and one can only truly see their girth as they emerge from the river." 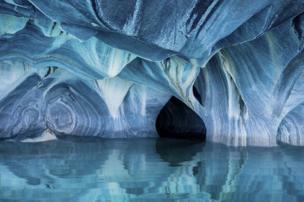 Clane Gessel's submission was taken in the marble caves, Torres del Paine, Magallanes, Chile, at the southern end of South America. 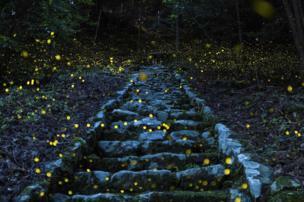 A remote village near to Tamba, Japan, was the location for Yutaka Takafuji's firefly-speckled photograph of a path up to a shrine. 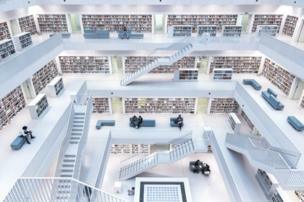 Norbert Fritz won the Cities category with his image of the sparse interior of Stuttgart's city library. He said, "With its wide open space in the centre... it has a very unique atmosphere, where you can broaden your knowledge." 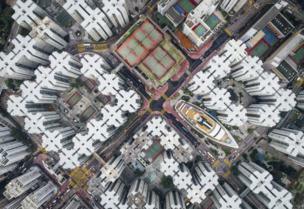 This aerial image of Hong Kong won Andy Yeung second place. It was inspired by the the Kowloon Walled City, a notoriously dense city that was demolished in the 1990s. "If you look hard enough, you will notice that the city is not dead," he said. "Part of it still exists.... I hope this series can get people to think about claustrophobic living in Hong Kong from a new perspective." 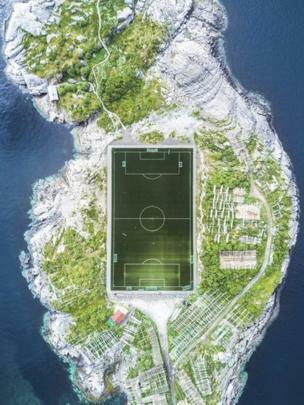 Misha De-Stroyev captured this football pitch in Henningsvaer in the Lofoten Islands, Norway, from a height of 120m (394ft). Although the week before was rainy and cold, it cleared up enough on the day for him to be able to fly his drone and get this shot. 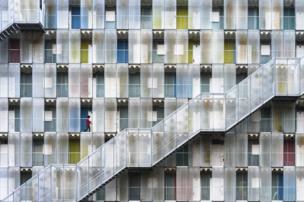 The bright colours of this building in the Gifu Prefecture of Japan are what captured Tetsuya Hashimoto's eye. The picture won an honourable mention in the Cities category. 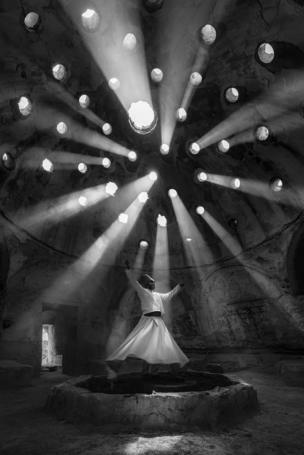 In this photograph which won first place in the People category, F Dilek Uyar captured a Whirling Dervish in the town of Sille, in Konya, Turkey. 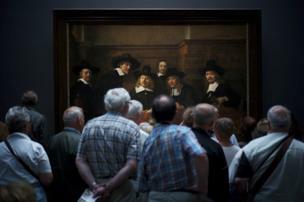 Second place was Julius Y's photograph, taken in front of Rembrandt's painting Syndics of the Drapers' Guild. By photographing the crowd in front of the painting, he said this, "gave the illusion that the people in the painting are also curiously watching the visitors". This underwater image by Rodney Bursiel is of pro surfer Donavon Frankenreiter in Tavarua, Fiji. He said, "I'm always looking for new angles and perspectives. The usual surf shots have all been done so we decided to get a little creative. Makes you look twice." 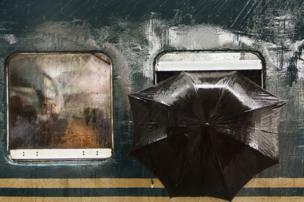 At Tongi railway station in Gazipur, Bangladesh, a man looks out of a rain-sodden train towards Moin Ahmed's camera. "Suddenly I found a pair of curious eyes were looking at me through the window," he said, "and on his left an umbrella provided protection from the rain." 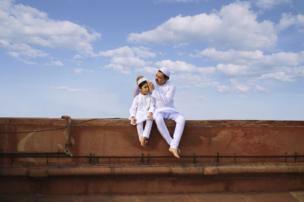 Finally, at a mosque in New Delhi, India, a father and son sit outside on the day of Eid al-Fitr. Photographer Jobit George said, "The photo shows the beautiful bond which these two generations have been building up in a very simple and lovable manner."